Today I am once again sharing with you our love of play dough! If you have not been here before, you should be warned we love play dough for learning! These free cookie play dough mats are no exception! Have your child make the correct number of cookies on the plate. 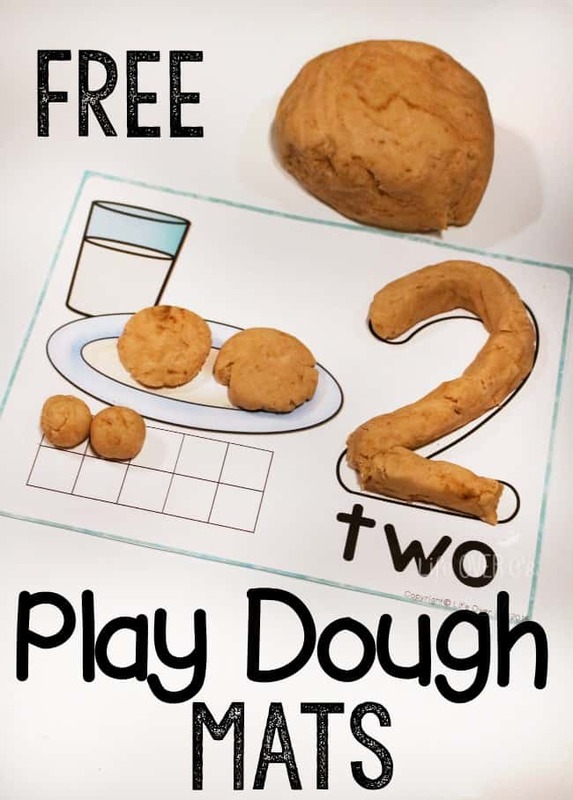 Not only are your kids working on their numbers in a very concrete and hands-on way, they are also getting some great sensory input from the different textures of play dough that you use (think oatmeal play dough for ‘oatmeal cookies’). This also works on fine-motor skills with the forming of the different pieces of play dough and if you choose to add toppings to your cookies, it can also work specifically on the pincer grasp. All of these are things that young child need to work on and many special needs children need extra practice with. Using the play dough and two kinds of buttons have your child show you as many ways to create the number using addition problems as they can on the ten-frame and on the plate like we did with our Christmas tree mats here. With the number 10 they can show you 9+1, 8+2, 7+3, etc. Follow Kim- Life Over C’s’s board Play dough on Pinterest.